After six weeks my Vaporatat L408J1017 seems to have malfunctioned. The Vaportat was set to a cut out of about 10 ozs on a two a two pipe steam system. The Vaportat is on a new pigtail along with the pressure gauges, no snubber. Everything worked as expected for about six week. Today I noticed a long burn on the boiler, and upon checking saw that the pressure was heading north of 1 psi on the low pressure gauge (1-5 psi). The pressure gauge is mounted on the same pigtail as the Vaportstat. After some observation, it was clear that the Vaporstat was not cutting out on pressure as expected. As a back up, the Pressuretrol is managing the cut out at about 1.5 psi (more or less). The Vaportstat is relatively new (six weeks old). Anyone have any suggestions on how to troubleshoot? Can anyone recommend a replacement model that might be more reliable? You are not the only one noting failures with the L408J series vaporstats. It is becoming increasingly clear that this product model is having more than its fair share of failures. Unfortunately for all of us, @zoom, there is no current replacement that I know of. If anyone else can chime in with their experiences with this model, please do so. Honeywell can no longer credibly claim ignorance of this issue. See if you can find one of the old mercury ones... No, you can't have mine! It's disappointing that Honeywell doesn't make a better quality product. But it appears that they have a monopoly position, so no incentive to improve quality. I am going to try the 16 oz model, L408J1009, as a replacement. Perhaps I'll have better luck. I imagine anyone with a mercury switch version is not letting go of it very soon. @zoom , I think there is a post on here where @Gordy or maybe @Gordo had several bad L408J1009's on the bench testing them. They all failed the same way and were all a year or so old. I don't think you will have any better luck with those unless you can find one that is maybe two or three years old. Honeywell must have changed something in the past year or so. I have a 1009 that has been on my boiler for about three years and works flawlessly, so far. It's very discouraging not to have any options for a very basic control. Perhaps I can search for used L408J1009 that is older. If it's only 6 weeks old and failed take it back and demand a replacement. make some noise if you have to. 2 pipe you say? Very easy to run with no measurable pressure at all. Much more comfortable that way too. I have the old vaporstat with the mercury switch set on the lowest cutout possible. It hasn't tripped once in over 20 years on my 2 pipe. I will complain to SupplyHouse where I bought the Vaporstat. There seems to be a pervasive quality control issue with these Vaporstats. Unfortunately my boiler is over sized. On a cold start (or set back recovery, just about three degrees over night), the boiler hits a "natural" pressure plateau at about 1 psi (with no Vaporstat pressure control operating) where the boiler runs for some minutes without a perceptible pressure increase. After perhaps 5 minutes at ~ 1 psi the pressure begins to climb again, presumably because the radiator traps are closing down. The Pressuretrol cuts the pressure off at about 20 oz on its lowest setting. The system then goes into vacuum and the cycle starts over. If my boiler was sized correctly, I think that it could maintain ~ 1 psi without overshooting. Ideally I'd like to run the system at ~10 oz cut out, which the Vaportstat was doing until it failed. Next year I was considering Lo-Hi_Lo firing, which is an option with my burner, to see what benefits that provided. I have spend a lot of time and money resurrecting the non functioning steam system in my new house. It irritates me that 100 year old system now provides rapid, well balanced heat to all three floors, yet a new, basic, low-pressure control of sufficient reliability can not be readily purchased. I rewired a lbg using the lo-hi-lo option. Cycles are much longer and no pressure trip, which is saying a lot for an oversized 1500 mbtu system with only 4 hoffman 75s venting 300’ of pipe and no riser venting. That's encouraging. I think this is something I'll take on in the April time frame. How are you controlling the lo-hi-lo? What type of control? Honeywell will do nothing, I'm sure all the care is that the thing cuts off lower than 15psi when it leaves the factory. Hopefully Supply House will exchange it for you. I don't recall what the warranty is but I'd expect 90 days if not a year. Monopolies are great if you are the manufacturer, not so much if you are the end user. Perhaps one low-cost strategy is to form a loosely knit "board" from knowledgeable professionals on low-pressure steam systems that can provide a "preferred" designation for controls, burners, even piping configurations. The lack of a preferred badge designation would not likely prompt Honeywell or any other monopoly to up its game, but it might signal to alternative manufacturers that there is a gap in the market to be exploited. It’s on a pressuretrol set at 0.5 cut in with 1 on differential. The control on this boiler required two wires to be cut and wires to pressuretrol. Pressuretrol interupts the high fire at 1.5 psi (opens the wire) and runs on low fire until it hits the 0.5 cutin (closes the wire) which kicks it back into high fire. Took about half an hour to wire. Verified operation. I’d prefer to swap out pressuretrol with vaporstat but owners don’t want to spend any more money. They spent a sizable amount on an install that set the pressure so high (6 psi) that water was backing up into the nearest main vent. Also condensate returns was leaking about a gallon a minute. After fixing return leaks, setting pressure to lowest setting, shimming radiators and moving thermostat (wasn’t even hooked up by installed, system running on pressure, melting chocolate in cupboards) system purrs now. @nicholas bonham-carter the diaphragms on both the Honeywell Pressuretrols and the Vaporstats are stainless steel. No rubber. One would think they could get the quality of those diaphragms consistently reliable. It seems like somewhere in the last year or two they have either changed to design of the diaphragm or the metal thickness. I think per some bench testing that Gordo did, it seems the diaphragms tend to pucker/warp fairly quickly. Running at low pressure certainly helps with even heating and in my case with excess water loss through the old radiator valves. So I like the lo-hi-lo set up. But the dilemma remains on how to control the low pressure since it seems that the Vaporstats can not be relied upon. @zoom , there a thread on here that outlines how to build a pressure control using some low cost Dwyer components. Seemed to work well. Here is a link and I think the specs and design diagram is on here as well. I think the edge seams on the recently made stainless steel diaphragms are slightly defective, allowing pressure to bleed away and allowing excessive amounts of non-compressible water to enter the diaphragm space and pucker it out. I was able to wash out the stuff from the above pictured vaporstat and get it to work, but that meant re-calibrating it (and violating the witness mark on the calibrating access port). So the unit is a demonstration piece only. 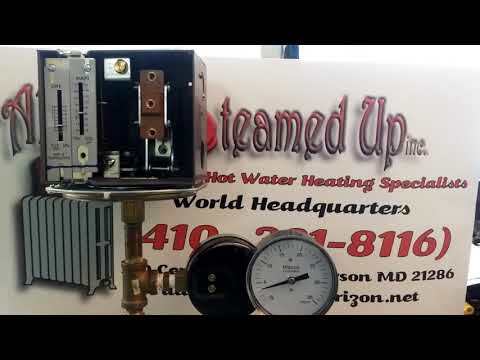 If anyone wanted to make custom pressure controls for steam heat, I would imagine the amount of testing to get all the UL etc. type approvals would keep you out of the marketplace. However, if something was sold as an after market device for convenience only and not as an operating safety device, then would the liability issue lay with the original MoneyWell pressuretrol that came with the original equipment? Say I installed a wall switch in my living room connected in series with the limit controls of the boiler. When I got water hammer or vents spitting I could shut the boiler down.....don't we call that a thermostat? Or your device fails to open......then instead of ounces operation you fall back on the questionable settings of the pressuretrol giving you maybe 1.5 PSI max. The threads on how to build a limit switch are fascinating. i will review them. However, as a simple homeowner, I would like something more "out of the box" that I can install quickly. I was going to add that I don't feel that I know enough to make a reliable control device, but seeing as how the Vaporstat is completely unreliable, simply knowing enough might not be sufficient anyhow. So far the Vaporstat is working well. The snubber significantly changes the behavior of the system. The snubber eliminates the pressure spikes that used to occur at around 10 oz. allowing for a more precise pressure cut out. I can run the system with a reliable cut off of about 6 oz now. There is also a longer delay before the boiler refires since the snubber "holds" pressure for longer. The end result is that the snubber has significantly helped with the boiler short cycling I have with an over sized boiler. i also suspect that the snubber will allow the Vaporstat to last longer by absorbing the pressure fluctuations. 1. I placed the snubber before the pigtail. I am wondering if the snubber should come after the pigtail so as to get some protection from dirt? 2. Does anyone have an estimate of the pressure difference across the snubber. I am wondering what is the boiler pressure when the Vaporstat cuts off at 6 oz. 3. Can anyone direct me to a coupling that I can use to detach the Vaporstat without having to unwire and rewire the control, which is a pain? Can you post the link for the snubber you used? You can easily install a regular union on the tree above the pigtail. This will let you remove the vaporstat with ease. You have quite correctly identified [as have many others) that once you have hit a pressure stop you already have way more steam in your system than you need for current conditions and you are obviously also aware that your boiler really doesn't need to run again for a while. The trouble is that while you know that, your vaporstat based control doesn't. will heat enough on design day is at least two times bigger than really needed on an average day - so your "oversized" boiler is not the problem either. If you really want to improve your situation think about adding a delay on timer that will simply prevent another firing for an adjustable amount of time following each pressure stop. Many here have done that with great sucess. Doing this is pretty simple and will even out your heat a lot. Save yourself a lot of trouble trying to control extra cycles with pressure as fundamentally you really don't want any pressure at all anyway.